It’s an innocuous question. The sort of small talk we exchange on a weekly basis. But lurking within it is a subtle, but provocative point: We are always asking one another to pass judgement on our days. 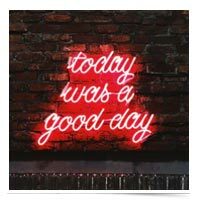 Was it a good day? Bad day? Was it fun? Hard? We pay a lot of lip service to the idea there will be ups and downs, but most of the time we’re rooting for the high times and dreading the low. Is this productive or even healthy? Maybe there’s a more useful mindset we could use to think about our days. Rather than categorizing everything that happens to us as “good” or “bad,” maybe we could consider that every experience offers us an opportunity to be taught. Surely you’ve been able to look back on “bad times” and recognize ways they’ve made you resilient, helped you see your life more clearly, or powerfully influenced your values. Would you unwish them, now possessing the lessons they contained? Were they really negative experiences if they yielded wisdom? This week, try not to see the events of the day as carrying an immediate positive or negative charge. Instead, see them for what they are: A series of teaching moments.